CLARKSON, Thomas (1760-1846). Philanthropist and anti-slavery agitator. Remarkable Autograph Letter Signed to 'Dr Marsh' (unidentifed), ½-page 8vo (trimmed, dust-soiled, and laid down on an album leaf with an engraved portrait, no date. 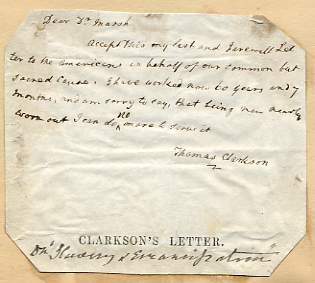 A printed or stamped inscription, 'Clarkson's Letter' at the foot and a note 'On Slavery & Emancipation' in another hand, perhaps that of the recipient. The letter appears to have been written to an American towards the end of Clarkson's life.